Bringing it all together let’s wrap up with some suggestions and backtests of how to implement the meta strategy in different kind of portfolios. To get up to speed read a short summary here or the whole series including the basic premises behind it starting here – for the concrete strategy only you can follow the three posts from here. Because the meta strategy is built from versatile modules it is easy to adjust and exchange input indicators as well as the output – the actual portfolio allocation to assets and strategies – to fit individual preferences. Remember, a good strategy is one that you can stick with in practice. Investing and trading is full of behavioral pitfalls – it is vital to find a process that you can trust in and that suits you personally to have a chance to succeed. The meta strategy is a portfolio allocation tool, that can make good strategies truly powerful by minimizing the impact of the bad periods every investment and trading method has to endure. There are dozens of ways to build portfolios from value investing to short-term trading strategies and, I’m sure, you have some core ideas you trust in already. These portfolio examples represent my own favorite strategy ideas – all of which I have used in practice for several years. I do not believe that individual stock selection is likely to add value, therefore you will find no stock strategies, apart from quantitative factor screens covering a broad base of securities, in my blog. Most of my ideas seek to harvest different risk premia in the most efficient ways I found. This includes risk premia of different asset classes, mainly the equity risk premium, and investing advantages present in carry (which includes the volatility risk premium) and trend. You can find the description and evolution of different strategies in previous articles. One of the simplest, yet one of the most effective tactical allocation strategies, is Antonacci´s Dual Momentum (GEM). It can be very easily implemented by any investor willing to spend 10 minutes per month to rebalance his portfolio between two equity ETF (US and World ex US) and one bond ETF. Spending a little more time we can add commodities as a third asset class to address the specific problems of an inflationary market environment (e.g. the 1970s were a bad time to invest in stocks as well as bonds). We allocate in three stages to equities (our main return driver): 0%, 25%, 50% or 100%, according to the state of the fundamental and technical indicators used in the meta strategy: green, yellow or red (start reading here for details). We buy US or World ex US ETFs according to their relative strength (invest in the one with the highest return over the last year). If we are less than 100% invested in equities (which has been only about 25% of the time historically), we buy a short to medium term bond fund with the balance, as long as bonds are up over the last year. If bonds are down and we are less than 100% invested in equities we buy commodities or gold (whichever is up more for the last year) for the balance, as long as commodities are up over the last year. This rare state of the strategy would be a strong indication for an inflationary environment. If everything is down over the last year and we are less than 100% invested in equities, we stay in cash. For example right now. The measure „up/down over the last year“ is very robust and you can choose a lookback period anywhere between 6 and 15 months or instead use moving averages (e.g. around 200-day or 10-month SMA) or moving average crossovers, that reduce sensitivity and whipsaws (e.g. 50-day/200-day SMA cross). Differences in results will essentially be down to random luck, which is why we use gradual exposure changes in the meta strategy to dampen the role of luck – especially in equities, where it matters most. 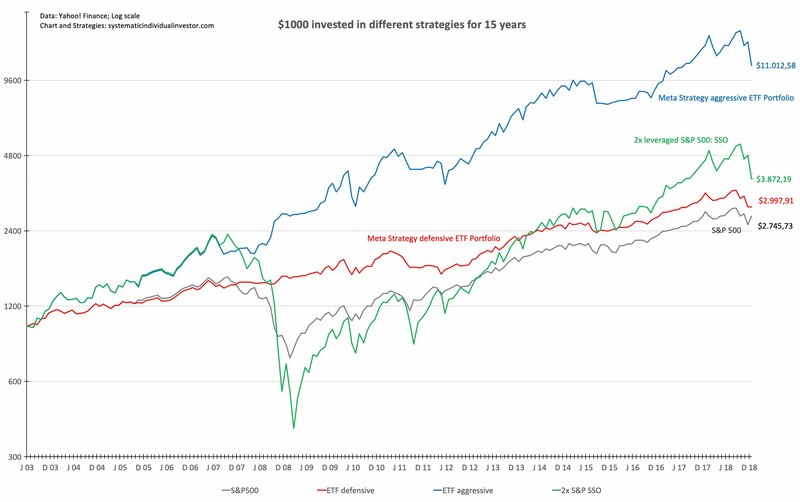 A 15-year backtest of the Meta Strategy Defensive ETF Portfolio (in red – click chart to enlarge) shows the advantages distinctly: Losses in the worst bear markets are reduced, while overall returns are improved. The strategy earned about 1% more annually than a buy and hold investment in the S&P 500 (grey) and the ride was a lot smoother, avoiding the sleepless nights of 2008/09. For anyone who wants to implement this, but doesn’t want to go through the background work, I have started a newsletter (it includes the aggressive ETF strategy below). It is sent out monthly and whenever rebalancing is required between issues. If you are interested in receiving the letter for a moderate yearly fee, please subscribe here. At the moment we are starting fresh as the portfolio is 100% cash right now. A more complex ETF portfolio solution, that seeks enhanced returns in good as well as very bad times. Leveraged ETF can be problematic in choppy market environments, because of a volatility drag caused by their daily rebalance. This is especially detrimental during large drawdowns, but conversely the rebalancing effect boosts returns (in addition to the leverage) in a straight-up environment. Because the focus of our portfolio strategy is to keep most drawdowns in check below 20%, using leveraged ETF has enhanced returns considerably in the past despite of some volatility drag (e.g. a 2x leveraged equity ETF has improved equity performance in our strategy by roughly 80%). Short equity ETF are notoriously difficult to use profitably (they fight against the strong equity risk premium and also suffer from volatility drag). But my backtests (see below) show that, if we are very picky and only short in a recessionary environment when the strictest technical measures are violated (both fundamental and technical indicators show red warning signals), they add value in the long run. Additional returns are generated in the very worst environments, when they are often much needed. Losses in short lived bear markets are quickly made up by the leveraged exposure in the following bull market. Use the strategy above with 2x leveraged equity ETF. bonds or commodities are up over the last year. Then we diversify between those asset classes and short equity (equal weight). Bear markets are usually short and prone to strong equity rallies – it is wise to diversify our short exposure by adding up-trending asset classes. We use additional criteria to fine tune the exit on the short side: we use an extended move to the downside (25% below the long term moving average) as a profit target to avoid giving back most profits in a violent rally from the bottom. The 15-year backtest of the Meta Strategy Defensive (red) and Aggressive (blue) ETF Portfolio (click chart to enlarge) allows for an even better comparison: Reduced losses in the worst bear markets make a responsible use of leveraged and inverse ETF possible. The aggressive strategy more than doubled the annual return of a buy and hold investment in the S&P 500 with fewer than two allocation changes per year – 16,70% vs 6,73% leading to 3,6x more money over the 15 year period (not including dividends or transaction costs). For comparison I included the performance of a buy and hold investment in a 2x leveraged S&P 500 ETF (green): here the lethal properties of untamed leverage become apparent – a 83% drawdown in 2008/09. 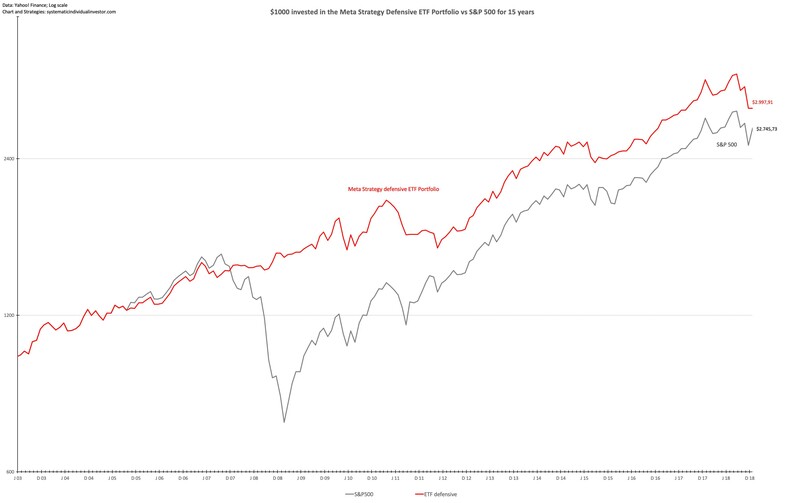 Impossible to tolerate for virtually anyone, even though it did lead to higher returns than the S&P 500 (grey) over the long run. It is possible to use leveraged ETF throughout all asset classes – it should work well, but I have not tested the results. This refined Tactical Global Asset Allocation strategy is the backbone of my portfolio. You can see the evolution that has taken place by going back to the investment blueprint I laid out 1 1/2 years ago. We can also adjust exposure to many possible alternative strategies, that use different concepts (e.g. trend, mean reversion, carry etc,) on different time frames, to form a complex portfolio that harvests several uncorrelated return streams. To make this work, we need to be aware of the characteristics of these strategies in different market environments – how are they likely to perform? Where lie their strengths and where their weaknesses? This can be found out by analyzing backtests over several market cycles and also by categorizing strategies according to the principles they rely on. negative skew strategies tend to be very profitable in good times (in an up-trend with low volatility), but carry high crash risk. For example, leveraged equity exposure, short volatility, carry strategies etc. positive skew strategies thrive under high volatility and can provide crisis alpha. For example long/short trend-following strategies, short equity exposure and other asymmetric bets. For a more detailed background on the characteristics of negative and positive skew strategies and their combination read on here. We can use the meta strategy to define the market regime we are in right now in a nuanced way and find the best strategies to use at the moment. Good times, when all indicators show green, are actually the most common state and we can allocate primarily to negative skew strategies, that have extraordinarily high Sharpe ratios (risk-adjusted returns) in good times – this will boost returns considerably. These strategies inevitably come with a higher crash risk and we need to heed the warning signals of the most sensitive indicators to scale down exposure to the most risky strategies. Short Volatility Strategies: I use two methods, short VIX Futures (or a variation using VIX ETP and VIX ETP options) being the most risky of my strategies which switches itself off immediately, when yellow technical warning signals are triggered. In the last couple of years this has been the best return driver in my portfolio, even including volatility explosions as we saw in February 2018. Slightly more moderate is my market neutral Short Options Strategy, which I tilt by momentum and scale in exposure in the same way as equity exposure in general. Leveraged Equity Exposure: as discussed above, but possibly implemented with futures instead of ETF. Trend-following Managed Futures: I always have some basic trend-following exposure to diversify the Tactical Global Asset Allocation and then scale my allocation inversely to equities to take advantage of the crisis alpha the strategy provides. There is often some overlap to other parts of the portfolio, but the strategy itself may go short as well as long all asset classes. Short Equity Exposure when all signals flash red: as discussed above, but possibly implemented with futures instead of ETF. The possibilities here are endless and the meta strategy can be used to adjust allocation to any long- or medium-term strategy, all the way down to day-trading strategies, which are also influenced by market regimes.